Early in 2008, a small group of REALTORS® who each had over fifty years of real estate sales and management experience met at 1912 North Meridian, the current home of the Metropolitan Indianapolis Board of REALTORS® (MIBOR). Their mission was to discuss how the organization might document the milestone of its 100th anniversary in January 2012. This book was created from their guidance, as well as the dedication and hard work of a core group of volunteers: thirty MIBOR members, our author Todd Gould, and an ever-present devoted staff person, Claire Belby. Their objective was to create a publication that would highlight not only the progress of the real estate profession over the last 100 years, but also to take a broader approach, which would integrate key events impacting the growth of the Indianapolis area. The resulting documentary, “REALTORS®: Opening Doors for 100 Years”, chronicles the development of the Indianapolis area and its contiguous counties – both through its text and accompanying DVD. Included in this documentary are profiles of numerous Indianapolis neighborhoods such as Speedway, Devonshire, Woodland Springs and Meridian Kessler. Since 1912, REALTORS® have played an important role in giving back to the communities in which they live and work. Over the years, REALTORS® have supported many organizations in the Indianapolis area, such as New Hope and the former Children’s Zoo. Those philanthropic efforts have expanded over the last decade through the establishment of the REALTOR® Foundation, which is committed to fighting homelessness in central Indiana. In celebration of its 100th anniversary, MIBOR also committed to a half-million dollar Building a Living Legacy project. This book details these very important initiatives and their effect on the community. In addition, the book gives special tribute to local influential REALTORS® who have attained national recognition for their contribution, such as Fred C. “Bud” Tucker and Helen Hirt. Former MIBOR executives and real estate leaders, such as Mary Binford and other prominent real estate figures in central Indiana are depicted. Also included is information on economic development projects, such as the United Airlines relocation, local REALTOR® membership information, as well as historical data on the development and merger of the various real estate governing boards throughout central Indiana. MIBOR was founded as one of the nation’s first real estate boards as a means to propagate the REALTOR® Code of Ethics – based solely on the Golden Rule – throughout its membership. The continuation of this mission remains its primary purpose today. By creating this book to commemorate its 100th year, MIBOR intends not only to give its members an important and useful history of the city relating to the real estate industry, but also to underscore the forward thinking of those early REALTORS® who have led during some critical stages in the board’s development. The result of that leadership has helped evolve MIBOR into one of the strongest, most advanced Board’s in the country. 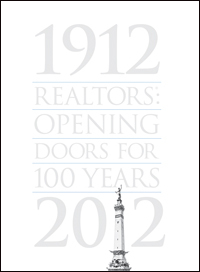 Enjoy “REALTORS®: Opening Doors for 100 Years” and take pride in central Indiana!